Unemployment and squander of human potentials - means how collapsed my hope for a better future, technological breakthrough, interstellar travel, change of attitudes, etc. Something extremely unjust keeps happening in our midst. Starting from the times of Jesus, until practically today, all inventors and all people who developed something highly creative for the good of our civilisation, are constantly subjected to less or more open persecution. I named this phenomenon the "curse of inventors" and described it on a number of my other web pages (e.g. see item #G1 on the web page eco_cars.htm.) I also seem to be a victim of it. If one analyses the life of any of these creative people, then it looks as if a whole hell tries to NOT allow them to accomplish whatever they try to accomplish. Even after they manage to complete whatever they intended, this evil persecution is not stopping. For example, these are NOT them who are reaping any benefits from their own ideas or inventions. In fact, from their effort and perseverance usually benefit these ones, who persecuted them the most. In turn many of them die alone, abandoned by all, in poverty and relative obscurity, sometimes their bodies being discovered many days after their deaths. Unfortunately, just such a fate seems to also be served to me. In spite that I developed a whole range of inventions and creative ideas of immense importance to our civilisation, I continually keep loosing the job and the source of income. Simultaneously, some sort of evil force continually makes for me impossible to find conditions for research where I could create and build in the atmosphere of understanding and approval, and without the need to hide from my employer and from my colleagues what I am developing and what I try to accomplish. Just recently, means on 22 July 2005, according to such a scenario of continuous persecution of creative minds, my 9th employer in the row, means the Wellington Institute of Technology from New Zealand, officially make me redundant from the job. Therefore, I am facing currently a difficult task of finding another place of employment and another source of income. This finding is even more difficult, because I try extremely hard to make this next job to become also a place where I could research and develop some out of technical devices which I invented many years ago. Since 1980 I unsuccessfully try to find a research laboratory, and a research position, in which I would be able to research and to develop several extremely important technical devices. These devices carry a potential to change completely the fate of our civilisation (for details see item #3 below). Because my next job most probably is going to be the last job in my life, I should do all in my power to cause that apart of becoming a source of my income, it also makes possible the research and development of two my most important technical devices. So let us analyse together via this web site, whether you, the reader, could assist me somehow in finding this one special research job, which would facilitate the construction of my advanced technical devices. After all, you may have information, which I cannot access, about a place in your vicinity, where just such a position is opening, or know where I could inquiry about a position which would suit my needs. So let us review together the information, which could be useful in finding this one special work which would crown my entire laborious life of an inventor and creator. As probably the reader already realises this, my situation is rather a special one, if not exceptional. On one hand, almost the entire life of a productive scientist and inventor, I devoted to one goal that is immensely important for our civilisation. Namely I was developing a new kind of technical devices, which after being constructed will revolutionise completely humanity, and also the life on Earth. What are these devices I am explaining briefly in item #B3 below. On the other hand, at the time of writing this paragraph I was already 59 years old. In turn, at the time when I find another job, most probably I will be at least 60 - if not more. So practically only this single opportunity of a next professional position is left, to build two most important out of these technical devices, namely the one called the "Oscillatory Chamber", and another one extremely vital for our civilisation which is called the "telekinetic battery". If I am to succeed, they actually need to be developed, researched, and implemented to a production before I go for a retirement. Therefore, this my present job search is not only about finding an employment which would allow me to survive, nor even about finding an employment for the undertaking of which I am professionally prepared. It is also about finding such a job which would allow me to build, research, disseminate, and implement into a production these two technical devices so immensely important for our civilisation. Unfortunately, these devices have such a character, that they practically provoked the entire hell to fight against them and to not allow them to be put into a use on Earth. If anyone study their history and descriptions presented in my newest monograph [1/5], practically each one of them was already build by someone and worked. However, then strings of extremely strange "coincidents" caused, that they were lost for humanity. From the shocking history of these devices we have now a duty to draw right conclusions. For example, I should try to select my position and the place of my next work in such a manner, that the previous history of these devices do NOT repeat itself any more. Therefore in this item I am explaining to the reader not only "what" or "where", but also "how" and "why". The point is, that the reader should be able to assist more precisely in this our mutual effort of finding for me a job which would allow to build and implement these two immensely important technical devices - in spite that since the beginning of time all devils and the entire hell has sworn to not allow them to be build and to work for humanity. Theoretically speaking, almost every job which allows an access to a research laboratory and to prototypes making, should allow for the building of these two devices. However, the history of these devices to-date teaches us, that not every such job allows for dissemination and for implementing them into a production. After all, these devices have a potential for generating enormous profits. They also give to their owners the significant power over other people. From their past we know, that if they are build e.g. in a private laboratory, or in a laboratory of any institution or group which generates profits, in this laboratory immediately appears someone, who has a power or a legal advantage over the builder of these devices, and such someone "locks" these devices, thus making impossible their spreading through the world. Just in this manner were wasted for humanity all previous prototypes of the devices which included the "telekinetic battery" into their principles of operation (i.e. prototypes of devices known in the world under the name of "Testatica" and "Thesta-Distatica"). Also in such a manner wasted for humanity was the only prototype of the "Oscillatory Chamber" in existence known to me. The conclusion which from this stems for my future job and future position is such, that this next my job, and also the laboratory which is to support it, must NOT be financed neither by a private person, nor by an institution or group aimed at generation of profits or interested in assuming a power over someone. This practically means, that the job and laboratory must be a part of some government-funded educational or research institution, the researchers from which have assigned scientific titles and thus have written into their positions the duty to publish and to disseminate research which they carry out. (Means, which do NOT have reasons nor tradition for making secrets from outcomes of their research, nor for turning these outcomes into profits.) On the basis of my knowledge of research institutions in present world I believe that just such a job would be a position of an academic in a significant number of specialisations in Mechanical Engineering at any technical university (however, excluding material engineering, welding, foundry, plastics, and other related specialisations). For example, the job in any area of machine building, production engineering, energy, design, exploitation of machines, etc., at any technical university, research institute, or research laboratory would fulfil these requirements. Furthermore, a job in disciplines outside of engineering, e.g. physics, mechanics, electrical machines, and even informatics - if this informatics is assigned to some department or specialisation which uses laboratory widely and has an ability to construct prototypes of researched devices. The same vital as the place of employment, is also the position on which I will carry out my research and development. The point is that from my previous (rather unpleasant) experiences appears, that if a given position is too low, then a person from a higher position (on which my position is dependent) always finds a manner to make impossible the research and development which I intend to carry out. Therefore, in fact the position should be at the level of Associate Professor. Only at this level, or higher, the holder of this position receives a sufficient scientific independence to be able to carry out the research on a subject area which he chooses. Furthermore, only then no-one is able to forbid him the publishing of results he worked out, nor forbid subjecting the devices he develops to a production. At this point I should add, that I already held a position of Associate Professor for 6 years. (Unfortunately in places where there was no right conditions for research and development of new technical devices.) So I do have the experience necessary for holding such a position. Summarising the above explanations, the most ideal situation would be to find a government funded university or research institution, which just have a vacant at an Associate Professor level (or at a full Professor level), in a specialisation that guarantees an access to a research laboratory and to development of prototypes being researched. The specialisation would need to have some interest in the area from which are my two devices that I intend to subject to the research and development, namely would have an interest in the "Oscillatory Chamber" and in the "telekinetic battery". So if by any chance, the reader already knows, or learns in the future, about a university or research institution which would be interested in these two devices, then I would be very grateful for letting me know. I would also appreciate the letting me know if there is any position which would be close to this ideal one, but which does NOT meet all conditions explained above. Perhaps it would be possible to negotiate conditions of work in there, which still would allow the research and development of the devices which I expect to become the main goal of my last years of professional activities. The most useful your assistence would depend on sending me information about a position which would turn suitable for building and development of devices to which I devoted my entire life (and which I described in item #B3 below). The required information arriving at a right time usually translates into a high chance for a success. After all, the biggest difficulty in finding a job that we want or need depends on finding-out where we can apply for just such a job. A second possible form of assistance in this searching for job, would be to give me contact details, for example names and email addresses, to institutions or people which know where such vacant positions are open, or just are going to open. Apart from these two most critical pieces of information, which may decide about the success in my search for a suitable job, in some cases perhaps you may know additional information which could increase my chances in getting a success with my application. For example, these could include an information, as to what should be emphasized in documents presented to a potential employer, or to what a special attention is given. What the employer is seeking, what additional documents could support my case, etc. Of course, as every other inhabitant of Earth, also you, the reader, would like to lead just such a happy, prosperous, peaceful, and fulfilled life. So in your vital interest lies assisting me in the completion of the mission which I am fulfilling on Earth. A part of your assistance may be just helping me in finding a next job that would meet conditions explained in item #B1 above. This is because if I find just such a job, and manage to implement through my research even a small part of what I intend, my success is going to turn to be also your own success. After all everything that I am doing will serve, amongst others, also you, your descendants, and all these whom you love the most. So let us try together to improve the situation in which all of us are. In order to provide here an idea as to what kind of improvement of the situation we all could experience if I manage to accomplish a success in what I intend to accomplish, let us consider what would happen if I build any of devices which I am developing. So let us review together the most important devices which either I invented, or I worked out for someone else, and the development of which I hope to accomplish in my next job. 1. The Oscillatory Chamber. This is one of the most important technical devices which I invented myself. It is also one of two key devices, which I decided to promote to the major goal of my research and development in a next job. Simultaneously, it is also a device, the construction and dissemination of which is hold back most desperately and most strongly by these symbolic evil forces which suppressed the dissemination of previous working prototypes of these devices (such working prototypes were already completed on Earth). Let us start from summarising here briefly what this Oscillatory Chamber actually is. The easiest description of it would be that it is an accumulator of energy of unlimitedly high capacitance, and simultaneously a magnetic propelling device. One function of it is, that on every our wish it is able to produce such a powerful magnetic field, that after being oriented repulsively towards Earth's magnetic field, this Oscillatory Chamber is able to lift itself into space. As such, it is able to provide a propelling device (i.e. a propulsor) for flying vehicles constructed according to the principles of so-called "Magnocraft" described below. In turn the ability of the Oscillatory Chamber for accumulating theoretically unlimited amounts of energy, means that in the future it is able to eliminate present electrical transmission lines (after all, the energy will be then transported after being packed into such Oscillatory Chambers), transformers, combustion engines, accumulators of energy, petrol, tankers, exhaustion gases, pollution of the air, etc. How more beautiful and better the world would be without all these! Many researchers already undertook attempts to develop the Oscillatory Chamber. In subsection S5 from volume 15 of my newest monograph [1/5], premises are described, that in past this chamber was already constructed on Earth at least one time. However, in order to accomplish a success in building it, and in order to subject it to serial production, it is necessary to understand deeply all details of it (I believe that I understand this device sufficiently). Unfortunately, in previous cases of building it, developers gave up before they reached the required level of understanding it. The Oscillatory Chamber is described comprehensively in chapter F from volume 2 of my newest monograph [1/5]. In turn the immensely important influence that the building of this device is going to exert upon our civilisation, is explained in subsection F9 from the same volume 2 of monograph [1/5]. Brief descriptions of this device are also contained on several web pages, e.g. on: pages oscillatory_chamber.htm or on eco_cars_pl.htm. 3. The Magnocraft. The Magnocraft is a flying vehicle with a magnetic propulsion system (also of my own invention). The Magnocraft is NOT included into the list of two key devices which I would like to build before I depart to my retirement. However, if I manage to build the Oscillatory Chamber, which represents the "propulsor" for the Magnocraft, then the vehicle itself can be constructed easily by other researchers. Magnocraft is described in details in chapter G from volume 3 of my newest monograph [1/5]. A brief presentation of this flying vehicle is also contained on several web pages, e.g. on magnocraft.htm or on propulsion_pl.htm. After the Oscillatory Chamber is build, the construction of the Magnocraft becomes only a matter of time. In turn after the Magnocraft is build, unlimited resources of space become open for humanity. The curious feature of the Magnocraft is, that this vehicle can operate without having even a single moving part. In this way most probably it becomes a least expensive space vehicle on Earth, the building of which will be affordable to even small countries. 4. A telepathic transmitter and receiver. These are devices which make possible the communication via an information carrier which is completely different from presently used electromagnetic waves. This carrier is already used by our minds e.g. for telepathic (unaware) communicating with each other. Therefore, one of consequences of constructing telepathic transmitters and receivers, will be that people learn how read thoughts of others at a distance, including into this also reading thoughts of animals. Moreover, they will be then able to "put" specific thoughts into minds of other people and animals. Although the construction of such a telepathic transmitter and receiver I removed purposely from my own plans of research and development, after the telekinetic battery is constructed it will open the way for building these telepathic devices by other researchers. The reason is that the telepathic transmitter and receiver, which in subsection K2 from volume 9 of my newest monograph [1/5] is described under the name of "telepathic pyramid", includes the telekinetic battery as the major component. So when this battery is constructed, and when we learn how exactly it works, we simultaneously will learn how to build and how to make operational such a telepathic pyramid. In such a case, probably soon appears a researcher, who will build this pyramid. In turn, after it is constructed, it will open for humanity the access to all these unlimited benefits stemming from mastery of a new technology of communication between people, which I explained in subsections K2.7 to K7 from volume 9 of my newest monograph [1/5]. 5. The Zhang Heng Seismograph. This is an extraordinary device build on Earth almost 2000 years ago. It allows a remote detection of impending earthquakes. Unfortunately, previously our scientists had no idea as to how it operates. For this reason numerous attempts to reconstruct it finished with defeats. Only my research allowed to explain the principle on which it operates. If our civilisation manages to build it, this remote detector of impending earthquakes has a potential to save countless human lives. A relatively good description of this device is presented on the web page named seismograph.htm. I do NOT hope for obtaining a realistic opportunity to even attempt the building of this device. After all, for such a building I am calling unsuccessfully for several years. However, I believe that if I manage to build two key devices indicated previously, namely the "Oscillatory Chamber" and the "Telekinetic Battery", then it will encourage other researchers to put a greater trust into other principles of operation that I developed, and to build the Zhang Heng Seismograph. It is worth to notice, that the above devices do NOT represent all that I research. After all, I am also researching numerous theoretical concepts and ideas. Their best example is the philosophy of totalizm. The aim of totalizm is to make more happy people who practice it. The description of totalizm is contained, amongst others, in volumes 6 to 8 from my newest monograph [1/5]. I also research and develop a completely new theory called the "Concept of Dipolar Gravity". It is in fact a theory of everything, means a kind of deduction path or reasoning thread, which allows to develop explanations for practically every phenomenon that previously remained unexplained, such as for example telekinesis, telepathy, nature of time, energy, gravitation, etc. I am also the author of the "Cyclic principle in propulsion development". This principle, amongst others, indicates to us how to build new propulsion systems which still do NOT exist on Earth (amongst others, it indicated to me how to build the Magnocraft). Furthermore, shortly before I was made redundant from the job at the Wellington Institute of Technology, means starting from 21 May 2005, I initiated the development of completely new idea in computerisation. I call it all in one idea. Although the development of this idea was interrupted abruptly due to the loss of my job, still until 22 July 2005 (in which day I was made redundant from my job) I managed to program already a second prototype of the so-called "totaliztic keyboard" which represents the practical implementation of this new idea. The totaliztic keyboard, in the state of development from 22 July 2005, one can find in a whole range of totaliztic internet web pages, e.g. on pages: keyboard_ru.htm, or all_in_one.htm. So if I manage to find a place of work, which allows me to build the two key technical devices which I indicated previously, this job should allow me also to continue with the development and dissemination of such theoretical concepts and ideas which I proposed and which are so needed by present people. In order to illustrate here better, what kind of progress will introduce a practical implementation in life also any of these theoretical concepts and ideas, let us have a closer look at this new idea of computerisation, which I developed the most recently. I call "all in one" this new idea, while I call the "totaliztic keyboard" the software tool which represents a practical implementation of it. Let us now explain briefly, what actually is this new idea of computerisation called "all in one." These readers, who sometimes make programs for computers, probably know already that there are two basic categories of calculations and computing tasks, namely (a) repetitive tasks (e.g. balancing of funds by a bank), and (b) tasks which are only carried out one time (e.g. calculating during our shopping in a supermarket, which product that they offer is more beneficial to us in terms of price to weight). Tasks which are repeated many times are worth to be computerized through writing programs. After all, the large contribution of labour for the completion of programs is returned for them when these programs are utilized. However, tasks carried out only one time are not suitable for programming. After all, the large input of labour for programming them would never be returned, if this program is used a single time only. Thus, computing of tasks which are completed only a single time, usually is completed either with calculators, or manually. The enormous processing power of present computers is not harvested for them. This is quite a regretful situation, as there is a large potential being lost. On 21 May 2005 I started to develop a kind of virtual keyboard for universal applications. I realized then, that this keyboard can be made almost infinitively universal, and that it can obtain almost all calculating powers that a given computer has. In the result, such a small keyboard can receive practically all capabilities, which presently are embedded into the most advanced programming languages and computers. But it still is going to maintain simplicity of a calculator, and still can be used just as a calculator - means just for completing single-use jobs. In this manner, the new idea for computerization called "all in one" was born. This new idea boils down to a design of a keyboard, which in a simplest possible form supplies the users with all capabilities of data processing that normally are offered only by complex and sophisticated programming languages and computers. In this way the powerful calculation abilities of present computers can be made accessible for these people who wish to carry out tasks for only single uses. Immediately after this idea evolved in my mind, I started to construct a prototype keyboard, which implemented practically this idea of "all in one". Unfortunately, shortly afterwards, my efforts were interrupted abruptly due to the making me redundant from the previous job. Until the time I was make redundant, I managed to contribute towards the development of the "totaliztic keyboard" only around two months of occasional programming and thoughts. On the other hand, in order to develop such a powerful software tool to a reasonable level, in my opinion it requires at least a year of continuous research, thinking over, testing, and programming by a single researcher. Fortunately, until the time when I lost my job and thus was forced to abandon this project, I managed to program a second prototype of the "totaliztic keyboard" for this "all in one" idea. Although this second prototype still leaves a lot to wish for, regarding the ergonomics, user-friendliness, and calculation power which it already received, still it illustrates well what this new idea "all in one" is about. So by checking how it works, the reader obtains quite a good understanding as to how this new idea "all in one" is able to facilitate all calculations for only a single use. After all, the reader is able to realize from this prototype, that in future implementations of this idea both text boxes can be made adjustable - so that they accommodate whatever the user wishes, that both alphabets (i.e. present Russian and present English + Polish) can be made replaceable - so that the user could switch/exchange them into Japanese, Korean, Thai, Arabic, Jewish, Greek, or any other alphabet in existence in the world, that the edition capabilities of this keyboard can be increased until they reach these from the WORD or WORD PERFECT, that the number of mathematical functions and physical conversions can be increased to practically unlimited extent, that the calculations carried out can be simplified and facilitated further by adding the capability to "recognize" in the text values that should be subjected to calculations, and by writing the results in any place that the user indicates, that to the processing power of this keyboard can be added graphics, animation, and whatever someone wishes, etc., etc. So practically, after full implementation, this new idea of "all in one" in fact would allow users to carry out with this single simple keyboard practically every type of data processing that present computers are able to do and that are on offer in the form of complex programming languages. And we know that there is a lot of such capabilities. Actually, even in the present, far from perfection form, this keyboard is already able to be utilised for facilitating an entire range of works, including calculations, translation, editing, typing, transliteration, conversion, etc. Furthermore, it provides us with an idea (a concept) which can be developed further e.g. by assigning to it diploma projects and doctor dissertations from computer sciences. In turn, after it is developed to the practically useful level, it will be able to enhance the work and life to a large number of people, who need to computerise and simplify all one-off activities that they carry out. Of course, the huge potential of this new idea "all in one" does NOT finish on the making it available to the awaiting ordinary users via present computers. After all, programming it into computers will open simultaneously the application of it in other areas. For example, relatively easy it can be implemented also on the cellular (hand) telephones. After such an implementation, each cellular phone would work practically as a totaliztic keyboard in the "all in one" idea, linked in a network with computers of a large processing power. One does not need explanations how our life gets improved, when users of all cellular phones rapidly get to their hands the calculation power equal to that of the most powerful programming language and computer, released with the simplicity of operating just an ordinary calculator. Although institutions, especially governmental ones, seem to operate independently who works in them, in fact it makes a big difference when they employ people of a suitable calibre. For example, if any of their employees is widely known, then also a given institution becomes known to everyone. If any of its employees accomplishes a success, then also this becomes a success of that institution. Therefore, at least in theory, all institutions seem to be so loudly devoted to attracting to themselves possibly best employees. (Though, please notice, that present employers usually have no clue what attributes a "best employee" should display. Therefore if, for example, Jesus Himself lives presently and He seeks a job, most probably He would have serious difficulties from practically almost every present employer. Furthermore, probably, the majority of His professional colleagues would not save Him from typical disappointments, gossips, and professional rivalry of present employment places.) So here is the list of virtues, which in my opinion I always bring with myself to the institution in which I work. 1. Huge professional experience. In fact I am a scientist since 1970 (means continually for 35 years). In this long period of time, only for 2 years I remained unemployed. But even then I carried out privately rather intense scientific research. In the remaining time I always had a job at some higher educational institution. During my professional career to-date I lectured at Universities in 5 different countries, namely in Poland (for 12 years), New Zealand (for around 15 years), Cyprus (for 1 year), Malaysia (for 3 years), and on the tropical island of Borneo (for 2 years). I occupied positions from the lowest level (i.e. the last one, which I lost on 22 July 2005, was at the level of "Academic Staff Member" - this is the lowest level at this educational institution), up until the level of Associate Professor (which I held for 6 years). I also lectured and carried out research in two completely different disciplines, namely in computer sciences and in mechanical engineering. 2. Fluency in English. Starting from 1982, means for the last 23 years, in tertiary educational institutions in which I work I continually use the English language. Also this English represents the most difficult version, because it is a technical English. I use it fluently both in speech and in writing. (Though, I am NOT a native English speaker.) This is a handy skill, as the majority of even non-English speaking countries gradually introduces to their Universities some subjects which are lectured in the English language. The special emphasis is placed there on lecturing in English at least one professional subject which lies in major specialisation of given students, for example something out of mechanical engineering for Mechanical Engineers, something from computer sciences for Computer Scientists, something from the area of physics or mechanics for teachers, etc. The point is to allow students of every non-English speaking country to learn practically the professional English terminology from their discipline. Also it is to teach them to utilise practically the ability to use English professional literature. After all, at present there is much more professional literature in English, than in any other language in the world. The fluency in technical English means that I can lecture (and I was lecturing) in English not only in English speaking countries, but practically also in every country and educational institution which decides to have English as a language of instruction. Note that my use of English for lecturing is documented in practically every document from my former places of work. 6 reports commissioned by industry. In turn users of the Internet know me probably from my numerous web pages. At the time of writing this information I maintained around 60 operational web pages for various topics. In the first half of 2005 their hit counters were indicating in average around 1000 "hits" per day. 4. Knowledge of computerisation and informatics. This is especially useful knowledge on positions outside of computer sciences. The reason is that people employed there usually are slightly behind the development of computer sciences in the world. On the other hand, in every discipline, especially in these which concern or boil down to carrying out experimental research, the obtained results require the promotion in Internet, should be presented and make available to interested people, should be disseminated to peers, etc. I am a professional in just such activities. My capabilities in computer sciences (including web technologies) can be easily documented. It is enough in the search engine "google.com" type my name and see how many references is there to my research that I carry out. Other manner of documenting my capabilities in computer sciences is to demonstrate some out of powerful potentials of the "totaliztic keyboard" which I developed in person during the practical implementation of completely new idea of computerisation which I described above under the name of "all in one". This totaliztic keyboard can be viewed on the whole range of my web pages, e.g. on all_in_one.htm, or keyboard_ru.htm. 5. The habit of hard work and the lack of common vices. In order to work out and to accumulate the scientific accomplishments which I am currently able to present, I work every day practically over 10 hours. Thus, the hard and the result oriented work I already have in my blood. It become my second nature. This habit of hard and effective work is complemented with my moral personal philosophy called totalizm. In fact, at the present times totalizm is proud of being the most moral, peaceful, constructive, and satisfying philosophy in the world. By adhering to totalizm I do not have a custom of swearing at someone without reasons, show tempers or jealousy, gossip, persecute, etc. In every situation I try to be objective and "fair". Furthermore, totalizm make me also a relatively happy and fulfilled person. Due to it, I do not belong to these grumpy, bitter, mean, and sarcastic oldies, with which it is difficult to live. I am always smiling, polite, with good sense of humour, and ready to laugh from someone's jokes. However, because of the sense of responsibility which I feel, and also because of the nature of research which I carry out, usually for the majority of time I appreciate the value of seriousness and concentration. Of course, like every other person on Earth, I am also aware that not everything that I do, and not everything in what I believe, is approved by 100% of other people. (In Poland they have a good proverb for this, stating that "jeszcze się taki nie urodził, co by wszystkim dogodził" - meaning "no such a person was ever born that would pleased everyone".) For example, totalizm does not allow to permit others to attack us without consequences. The defence carried out in moral manners, and also telling the truth, calling things by their names, and removal of sources of evil which prevails in our vicinity, totalizm lifts to the rank of our moral duty. Therefore for every attack I try to reply with a moral defence. I also try to disclose evil and injustice even if I do not have a personal interest in revealing a given manifestation of it. Furthermore, I try to tell whatever I believe represents the truth in a given matter, even if this truth is painful or unpopular. 6. Fame. Although the philosophy of totalizm which I practice in my everyday life does NOT incline to seek fame or profit, the sole fact that I am the creator of totalizm, the Concept of Dipolar Gravity, and the inventor of a whole range of advanced technical devices, generates fame by itself. So independently of what would be views of individual people towards whatever I research and publicise, the fact remains undeniable that these are learned by ever increasing number of people. In turn such a growing knowledge of my accomplishments indicates, that although slowly and with many obstacles, still whatever I do gradually gains an increasing fame and recognition. Fig. 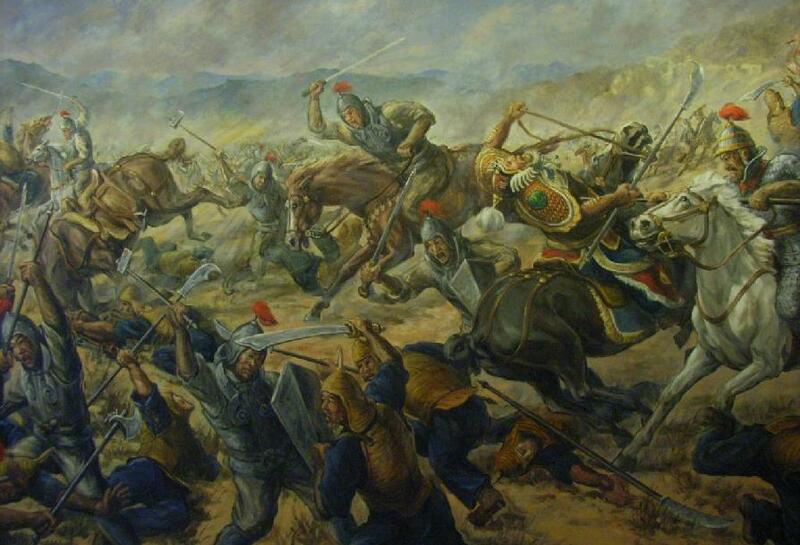 #B1 (A1 in [1/5]): Here is an example of painting from Korea that portraits a fragment of medieval battle. Emanates from it a scary enthusiasm with which people are inclined to kill each other. The picture reveals, that in order to accomplish easier the main goal of creation of a highly imperfect man, i.e. the fast increase of knowledge, God gave to the nature of humans an array of low inclinations, desires, deviations, etc. After all, these attributes lead humans to committing numerous errors and evil acts which perfect people would not commit. This in turn allows God to learn faster. But it also changes our planet into a kind of hell. So in order human communities could live in peace and prosperity, everyone amongst people must learn how to overcome these low desires. Independently from desires, inclinations, deviations, etc., which throw people into fights and cause wars, we must also learn how to overcome in ourselves, amongst others: thirst of power, sexual desires, greed, wish to dictate to others, etc., etc. Religions initially supposed to motivate people to overcome these evil desires and inclinations. Such religions God gradually created and gave to subsequent nations, or races, of people. Unfortunately, as we clearly can see it in present times, religions did NOT fulfil their function, and the humanity still is following its desires, tendencies, deviations, etc. In addition, atheistic science adopted recently the role of religions and devaluated the moral guidelines which God imprinted into religions. To this were added ambitions, trends, desires, and deviations of present politicians who, in order to please their voters and remain in power for much longer periods, generated a multitude of laws that legalised many amongst these human imperfections. These legalisations make an impression that it is "normal" to be aggressive, twisted, greedy, etc. In the result, a situation gradually eventuated that the humanity needs now something even more perfect than religions and believes. The only thing that is really more perfect than belief, is knowledge. So it appears, that the third millennium which the humanity is just entering, must evolve the moral knowledge about human behaviours which are acceptable, and behaviours which must be controlled. Let us hope, that instrumental in formulating this new knowledge, turns out to be, amongst others, this monograph with findings and analyses it contains. While seeking a next job I assume that the majority of work connected with getting it I will complete myself. So I will prepare myself all documents required, I will go through the interview, I will prepare and present a demonstration lecture on a given topic - if required by the future employer, etc. In turn after I find a job, I will carry out myself all duties which go with it. So by appealing with this web page for assistance in finding this special position, I do NOT expect by this that this will release me from any formalities required during employing a new person in a given institution (i.e. I do NOT expect to be employed for anything but my merit). Also, I do not expect that I receive any other treatment than all other candidates for a given position. (After all, the totalizm suggests that in every competition the best should win.) The assistance given to me should limit itself exclusively to the providing me with the required information about the existing employment opportunities, and about suitability of given employment place for research and development of technical devices which I try to build. I thank you in advance for providing just such a totaliztic assistance. Copyrights © 2013 by Dr Jan Pajak. All rights reserved. This web page is a report from outcomes of research of the author - only that is written in a popular language (so that it can be understood by readers with non-scientific orientation). Ideas presented on this web page (and also in other publications by the author) are unique for the author’s research, and thus from the same angle these ideas were NOT presented by any other researcher. As such, this web page presents ideas which are the intellectual property of the author. Therefore, the content of this web page is the subject to the same laws of intellectual ownership as every other scientific publication. Especially the author reserves for himself the credit-rights for the scientific discoveries and inventions described on this web page. Therefore, the author reserves that during repeating any idea presented on this web page (i.e. any theory, principle, deduction, interpretation, device, evidence, proof, etc. ), the repeating person gives a full credit to the author of this web page, through clearly explaining that the author of a given idea and/or research is Dr Jan Pajak, through indicating the internet address of this web page under which this idea was published, and through mentioning the date of most recent update of this web page (i.e. the date indicated below).